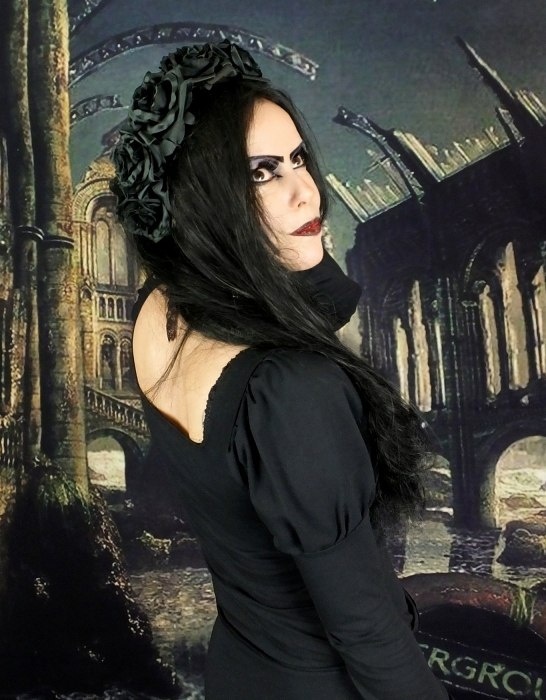 The perfect everyday AND everynight goth top - wear it to work, wear it in the graveyard, or wear it whilst swanning around the ruins of your ancestral manor.... perfect for all occasions! Here's the Gofficeia Top! <br> <br> Made from soft, slinky Cotton Lycra, it has a gently curved neckline, with a low back; gathered upper sleeves, and lightly flared cuffs - just flared enough to make dramatic gestures without dangling them in your mead! :D<br> <br> It's shown here in Black Cotton, but can also be made in any of our steamed velvet shades; see the colour choices below! It's worn in the pics with the Morvoren Pencil Skirt! The perfect everyday AND everynight goth top - wear it to work, wear it in the graveyard, or wear it whilst swanning around the ruins of your ancestral manor.... perfect for all occasions! Here's the Gofficeia Top! It's shown here in Black Cotton, but can also be made in any of our steamed velvet shades; see the colour choices below! It's worn in the pics with the Morvoren Pencil Skirt!